After Thursday's talks, indications are a deal might be taking shape. Commissioner David Stern said the talks had been "intense." He said it's "getting to be an important time." And he announced that next week's CBA talks would expand to include each side's full negotiating committee. Deputy commissioner Adam Silver chastised a reporter for suggesting there have been no new proposals lately. 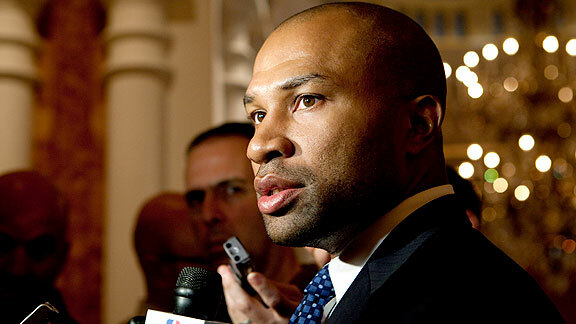 But the person who dropped the biggest hints that there is real movement in talks to salvage an NBA season from labor strife was union president Derek Fisher. The two sides have agreed not to characterize the talks to the media. And in the spirit of keeping that promise, Stern and Fisher peppered their talks with let's-not-get-carried-away language. Stern said, "I don't know if it's positive or negative," that the groups' meeting will expand next week. Similarly, Fisher said, "It doesn't imply that we're somehow on the verge," and added that, "We still haven't found that place where we can come out and say here's where we are, here's where progress is being made." But it's hard to talk for 15 unscripted minutes, as Fisher did, without dropping some hints as to what has happened behind closed doors. The most alarming of the hints came when Fisher explained expanding the meetings: "From our perspective, we want to make sure that our executive committee members who aren't in the room are able to really fully understand the deal, the deal points, all the information that's being thrown around the room, all the ideas that we're going back and forth with." A deal? Deal points? There are deal points? Fisher made no further references to "a deal," and surely he could have been using the word as a general term, to encapsulate "all the ideas" that have been bandied about. "We haven't wasted our time." "At some point, before you can try to make any attempt at large progress, you have to involve all the prospective members that are potentially going to make the decision. So we thought it was best to try and do it at this time." "We're trying to put together a pretty large puzzle with a lot of pieces. Until we get the pieces to fit right, it's just not fair to try and put labels on things. It's just best to stay focused on how we're going to figure this out. We feel like that has worked well." "We still have to make sure, at least from our perspective, that our group is aware before we can make any decisions. It's one thing to have a conference call as an executive committee. It's another thing for our guys to really see what has taken place over the last week or so." "We actually are negotiating. To think about where we are from July 1 to now, in terms of just the process itself, what is being discussed, what type of deal it will end up being, we've put in a lot of time. We'll continue that process and see if we can get a fair deal done as soon as possible." It would be a mistake to draw a very strong conclusion from these tea leaves. But it also would seem to be a mistake for a sense of doom to dominate among NBA fans. Not with the union president saying things such as "deal points," "that has worked well," "what has taken place over the last week or so" and "attempt at large progress," and marveling about how different things are from when the lockout started. Not with the union president talking about making decisions, a step that would have to be preceded by an offer or proposal to decide on. Clearly, important things have happened. Fisher was asked whether Mason made the comment with knowledge of the talks or not. Fisher's first answer was, "I'm not sure, to be honest." He then went on to explain that it was an "alleged tweet" and an investigation is under way into what exactly happened with Mason's phone Wednesday -- perhaps it was hacked. Fisher added that certainly now Mason has been fully informed about the state of talks. But you see how he answered that initially, saying, "I'm not sure"? From where Fisher is sitting, in other words, someone with real knowledge of the talks might tweet something like that. If the talks weren't going well, very well even, that'd be impossible.